My heart sank when farmer Wendy Baroli exclaimed, "A CSA is just a glorified grocer." As I share their vision, I was captivated to see how GirlFarm could succeed. For a three-woman team, manning a recently purchased 95 acre sustainable farm on the outskirts of Reno, at an altitude of 5,400 feet with gale winds averaging 70 miles per hour every third day -- where snow falls the first few days of June -- it appears (without wanting to sound pessimistic) that the odds are against them. 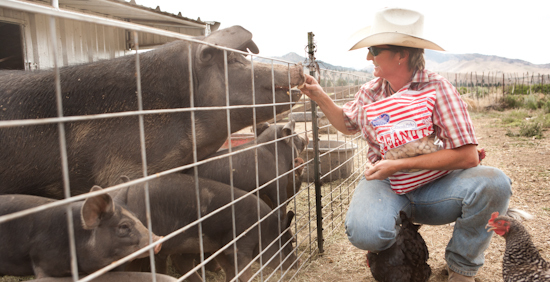 Wendy, a fourth generation Italian farmer, is protective of her heritage. Picking up where her grandfather left off (even with some of his tools -- like a 1930s plow and seeder), she's resolved to be a part of retooling the supply for the predicted global food crisis. A role model, she offers an intimate glimpse into a deeply personal story. 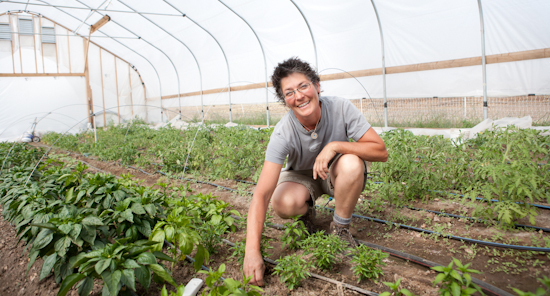 A realist, "high desert farmer" and unintentional "agro-revolutionary," Wendy is fully immersed in the regional farming condition in a state where agriculture is the third-largest industry. 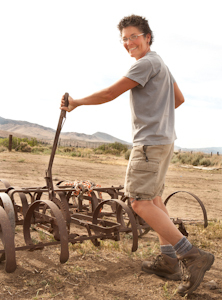 Though not formally trained as a farmer, she teaches at the Western Nevada Institute farm conferences. She became known for her advocacy by leading a grassroots petition drive to prevent the University of Nevada Reno from selling its agricultural land for development. The sale is on hold for now. Though a Land Grant college, UNR's de-emphasis of its ag program and focus on bio-technology, embodies all that she sees as wrong with the current approach to agricultural education. Originally conceived to teach "land based skills," many land grant college programs no longer pass on traditional farming skills -- a role that GirlFarm would love to play as a teaching farm. So how does GirlFarm make a living? Philosophically, GirlFarm's Personal Farmer Program grew out of economic necessity and a need to maintain a repository of traditional farming knowledge which is rapidly dying out with past generations of family farmers. This is a die-hard belief that small farms can still be profitable if they return to traditional methods of providing nutritious fresh food for local consumption. GirlFarm uses adaptive practices to provide the healthiest food possible for their member "farm families." As per Wendy, "The small farmer gets a fair price, consumers get a healthier product." She maintains that "...a CSA doesn't meet the needs of the small farmer because it is too labor intensive." She also believes that interns are not plausible as the taxes and paperwork are too demanding - that federal regulations impede small farm progress. In her own words: "SmallFarm/Big Ag.....a different paradigm." The Personal Farmer Program enlists member families in the workings of the farm during once a week "Farm Days" used for planting, repairs, cleaning and farm development projects - as well as for harvesting vegetables and herbs from the "custom produce list" developed in conjunction with GirlFarm. The families have intimate participation in traditional farming and share in the bounty of their efforts. Only 25 families a year pay $2500 each for the connectivity and for the resulting sustenance: one-quarter of a pig, cow and lamb, six roasting chickens, one turkey, a dozen eggs per week during the season and the weekly harvest -- total -- 100 people fed. A major source of income: livestock. "Raising animals for food, was not what I wanted," comments Wendy, "...but crops were not enough to sustain the farm. While it's painful to name our animals knowing their eventual fate, it serves as a reminder that they are sentient beings. It's costly to take the lives of things." Acknowledging that big ag is essential to produce crops for overseas trade, GirlFarm believes that this should be distinct from the production of food for the health of the U.S. population. By creatively working around the government programs that favor big ag, GirlFarm has developed a unique approach for the healthy sustenance of its community. Their progressive farming techniques, including minimal tillage, planting landrace seed and rotational grazing, are designed to maintain the health of the soil - in a way that only small farms using traditional methods can. "Much of what we grow, what we eat fresh on a daily basis, is actually termed a 'specialty crop' by the government. Real food is not a specialty crop," maintains Wendy. ...And as if Wendy, her partner Jill Heaton and sister CJ don't have enough on their plate with tending Dexter cows, a flock of Jacob sheep, Berkshire pigs, heritage small breasted chickens and turkeys (organs of large breasted breeds explode at this altitude), Omega-rich fields of hay, beds of vegetables, a hot house with pepper and tomato varietals - they still joyfully find time to replace the wooden floor boards in their farmhouse, personally sawing and refitting one board at a time. The dynamic result of a dream lodged in the traditional agrarian instinct, GirlFarm is forging an independent path in the new agrarian consciousness. Wendy's adage: "If you follow your passion, the universe will provide - though it may not be in the way you expect."